My battery has been ruined. A group of cells is dead, with a voltage of 0V. The rest marks 4'3-4'4V. Do you think that the rest of the cells can be damaged by overvoltage?, is it better not to use them, and changing the whole battery? How do you check the cell voltages? Measuring each by each on the BMS? How do they got damaged, do you know that? One or both batterypacks, and each parallel system or just one of the alltogether 4 parallel systems! Is the "only" safe decission. You have some idea what could have caused this, or are the just "old"? I've measured one by one, putting the tester on anode and cathode. The batteries are 1 year, I don't know the reason. I usually use a 5A charger, and I always charge at 100%. The two batteries have been ruined. The two cells in a parallel group are damaged. Also: How did you recognize they are bad? I make a video and upload it to see how I do.. Both side of the wheel? Or just one? And how much cells? We are suspicios that perhaps the damage comes from a defect Bms...so than changing the complete pack would be needed. Now it marks 4'3v, but 2hours ago it was 4'4v. Both batterypacks, and two cells each side (one group 2P each side). The weird thing is that it's both sides. He is the total expert, and perhaps he is anke just to change the defect cells. For sure he can check the BMS systems. Dont worry...if he can repair it..it will be fair prices. Thats all quite irritating..that both packs give up at the same time and both have a 2 pair cell defect or to high. Well, in fact I've already bought a battery in '1radwerkstatt', and when I went to mount it I realized that the other was also damaged. The image is the new battery. He didn't tell me, and I didn't think to send him the battery to analyze it, but now that the second one is ruined, I'll tell him. You all want to know why the batteries are bad? It's right here in his statement "I always charge at 100%". Don't we all know that ALWAYS charging to 100% kills the batteries? Unfortunately it only provides cell balancing, but no protection on cell level Each cell has its own circuit that shunts the cell with resistor if cell voltage is at or above 4.2 V - that's all. But shunting circuit will create only a small cell load of about 50 ... 100 mA. It's enough if all the cells are in similar condition, but if one or two cells in the string are dead, it won't protect rest of cells from overcharging. Overvoltage/undervoltage protection is only battery-wide. I wish that EUC manufacturers will someday add cell voltage monitoring to their batteries. As DJI did in the case of their smart batteries. Yes, I'm sure that from now on, I'm going to charge 80-90%. I already had the 'Charge-Doctor' but I didn't use it just yet. It degenerates cells a bit faster, but it gives them the chance to get balanced. Especially just within 1 year there is no chance that 100% charging ruins batteries. . Yes, I'm sure that from now on, I'm going to charge 8﻿0-90%. I already had the 'Ch﻿arge-Doctor' but I didn't use it just yet. Probability that your battery will fail is higher when always charging to 80 - 90 % than if always charging to 100 %. It's because balancing process occurs only when cells are fully charged. This is why you should also never disconnect your charger just after the green LED goes on / fan goes off. This LED usually doesn't mean that charging is finished. This LED usually turns on when charging current drops to about 0.25 A, but that may be long before the balancing process will even start. This is why it's good to have a current meter built into the charger (or use Charge Doctor to measure the charging current). Fully charging is harmful only in elevated temperatures (well above 30 °C). Want to prolong your battery life? Use fast charging only when needed and slow charging when possible. Don't charge battery immediately after ride. Don't disconnect the charger just after the green LED turns on. Don't store fully loaded battery in temperatures above 30 °C. If using partial charging, use small charging current and charge the battery fully every fifth charging cycle. My first statement was more a rethorical phrase showing my astonishment. So maybe KS does not "reprogram" their BMS and they come with the maximum 4.5V threshold? Or they "forgot" to adjust some charges? Or as @US69 stated the BMS had some problem at all? Lithium-ion operates safely within the designated operating voltages; however, the battery becomes unstable if inadvertently charged to a higher than specified voltage. Prolonged charging above 4.30V on a Li-ion designed for 4.20V/cell will plate metallic lithium on the anode. The cathode material becomes an oxidizing agent, loses stability and produces carbon dioxide (CO2). The cell pressure rises and if the charge is allowed to continue, the current interrupt device (CID) responsible for cell safety disconnects at 1,000–1,380kPa (145–200psi). Should the pressure rise further, the safety membrane on some Li-ion bursts open at about 3,450kPa (500psi) and the cell might eventually vent with flame. (See BU-304b: Making Lithium-ion Safe.)" 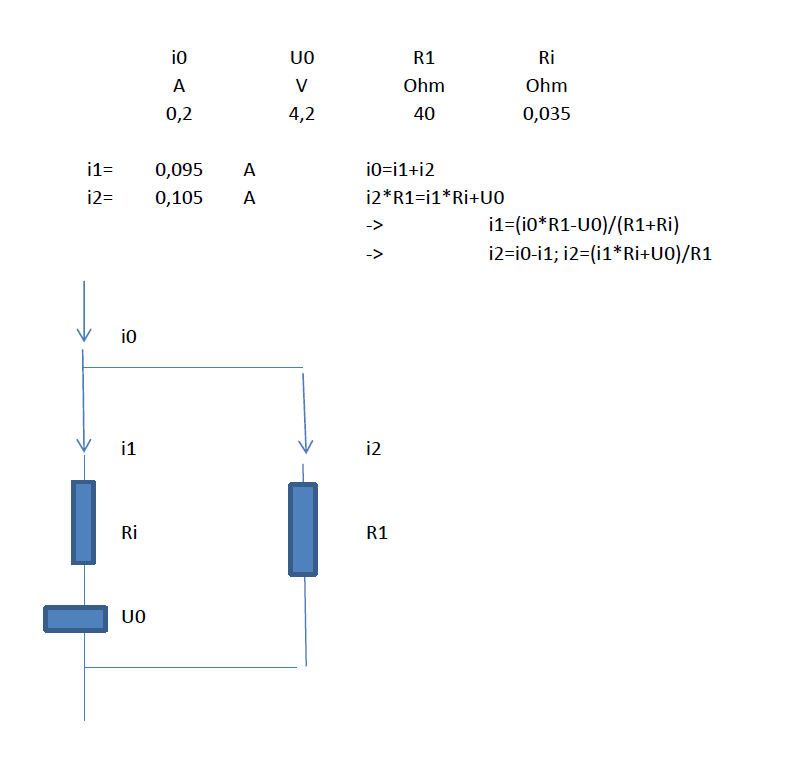 setting some cell based overvoltage limit at 4.25-4.3V should be more than high enough - if not already too high! Fully charging is harmful only in elevated temperatures (well above 30 °C). Want to prolong your battery life? Use fast charging only when needed and slow charging when possible. Don't charge battery immediately after ride. Don't disconnect the charger just after the green LED turns on. Don't store fully loaded battery in temperatures above 30 °C. If using partial charging, use small charging current and charge the battery fully every fifth charging cycle. +1! .... this can't be written often enough! That's pretty much what I try and do. I generally charge to 85-90% and then every couple weeks let it charge to 100% and leave it on the charger for a good 6 or so hours after the green light has gone on. Hopefully it prolongs the battery life on my mcm4, On my ninebot c+ I usually just charge fully as the battery isn't that large and well, it was used and I mainly use it to try and learn new techniques(right now learning how to ride backwards a little at a time) before trying them on my main EUC so i'm not using it to commute. I don't have a fast charger so am always charging using the stock slow gotway/Segway chargers but really I don't see much need for a fast charger in my use cases. if I don't need it why stress my small battery with the higher current and heat from fast charging. I just timed how long it takes to charge my battery ten percent and now if I want to charge X percent I just figure out an estimate for how long that should take given the rough rate of charge per minute I found out and set an alarm so I stop at 85%. Works well and doesn't cost extra money or need any extra devices. I get the need for a fast charger though for people with large wheels with large batteries who commute long distances to work and need them charged by the time they leave work later. No, not always in the KS packs because bms are not always equipped with components that balance the cells. inside yellow, nothing nothing nothing, ks saved 2 € by eliminating balancing ! ! ! In packs that have no balancing, the first pair of cells that reaches the threshold "Overcharge protection" stops charging by blocking input mosfets. Not so glorious but it works pretty much. I saw that the ks18s is equipped with balancing, for others I do not know. @Techos78 - your attachments are unfortionately not to be seen. Best is to upload pictures to some provider like imgur.com and copy a direct link here. Afaik most BMS are providing balancing, but only very limited. 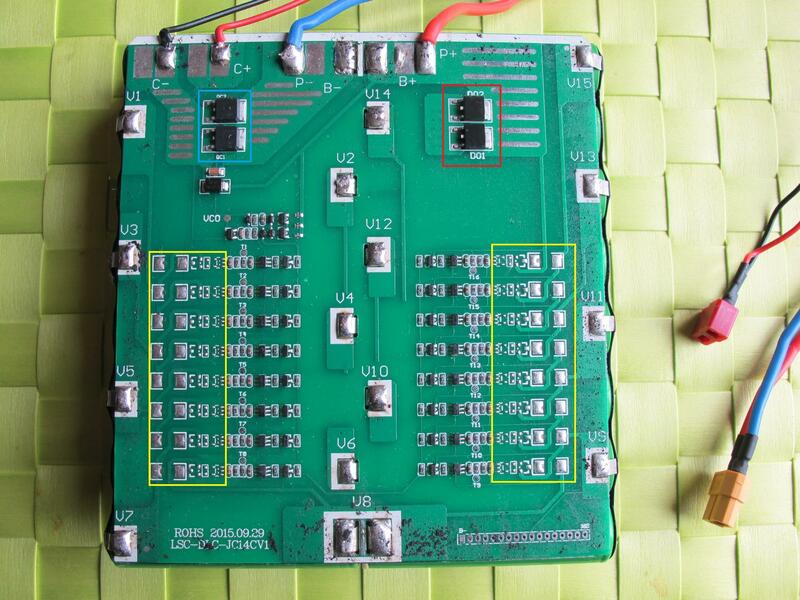 The BMS have some resistors on the board and use the internal MOSFET's of the ICs. There are some that have external MOSFETS equiped to provide higher balancing currents. Yes, you're right. When I was writing about balancing I meant that BMS at most offers the function of cell balancing, but the fact is that there are BMS that do not have cell balancing, as you wrote. 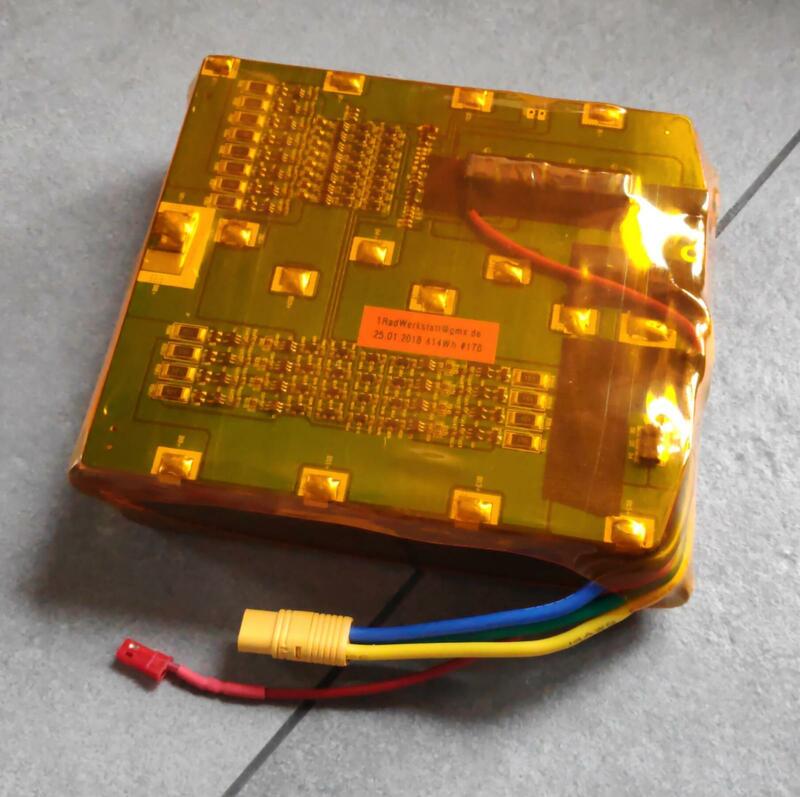 KS-18L and XL battery packs are equipped with bleeding balancers, but with 100 ohms shunt resistors they are able to offload only small part of charging current from the cells - just about 20 mA per cell (there are two cells in paralell served by single balancing circuit). So with such small current the BMS provide very limited balancing capabilities. Consequences are exactly as you described. This one is from KS-18L. There is no dedicated balancing IC, just standard circuit with voltage comparator and small transistor controlling bleeding resistor. If cell voltage raises above predefined level of, say, 4.2 V, resistor is connected in paralell to the cell by the transistor. This creates small load to the cell.